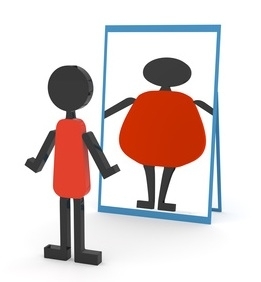 Eating disorders are characterised by an abnormal attitude towards food that causes someone to change their eating habits and behaviours that can affect them physically, psychologically and socially. Anorexia is when someone tries to keep their weight as low as possible, for example by starving themselves or exercising excessively. Individuals suffering from anorexia usually do not allow themselves to eat enough food to get the energy and nutrition they need to stay physically healthy. It is often connected to very low self-esteem, negative self-image and feelings of intense distress. Someone suffering from anorexia is likely to: reduce your food intake or stop eating altogether; count calories obsessively; hide food or secretly throw it away; use drugs that reduce your appetite or speed up your digestion; be obsessed with losing weight; make yourself sick or use laxatives; exercise compulsively; wear baggy clothes to cover up weight loss and keep warm. This can result in: substantial weight loss, feeling weak, feeling cold, hair thinning and falling out, irregular periods or periods stopping. Binge eating disorder is individuals can't stop themselves from over eating even if you want to. It is therefore sometimes described as having a food addiction or compulsive eating. Some people rely on food for emotional support or to mask difficult feelings. Examples of noticeable behaviours include: eating large amounts at once (bingeing); hide how much you're eating; regularly eat unhealthy food; eating until you feel uncomfortably full or sick; eat for comfort when you feel stressed, upset or unhappy. This can result in being overweight and associated health problems. If you are worried about yourself or someone you know, it is important to speak to a GP or a specialist group - some are listed below. You can search a list of local services providing support to people affected by eating disorders on the Beat Eating Disorders website here. Phone: 0845 634 1414 / 0845 634 7650 (Youth Line) Beat provides helplines, online support and a network of UK-wide self-help groups to help adults and young people in the UK beat their eating disorders. Phone: 01494 793223 Provides help and support to anyone affected by an eating problem such as anorexia nervosa, bulimia nervosa or binge eating disorder. It also provides help for those who are caring for, or supporting someone with an eating disorder. Phone: 0845 838 2040 Help and treatment for sufferers.